At Renu Laser & Skin Care we proudly offer Procell Therapies MicroChanneling with peptides, growth factors and stem cytokines! 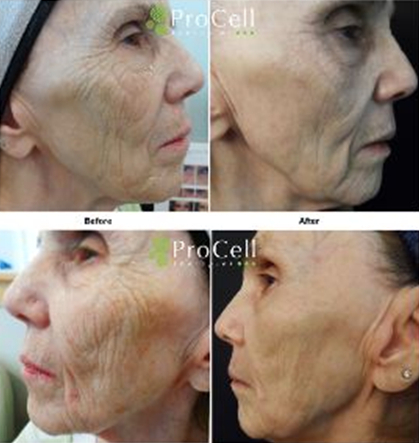 74 year old woman before and after 4 micro-needling treatments with ProCell Therapies micro-needling solution and home use of ProCell Therapies human growth factor serums. Microneedling is a non-surgical procedure comprised of microscopic punctures in the skin's surface that initiate a natural healing response. These perforations cause a healing cascade that produces new collagen and elastin resulting in firmer, healthier skin. We combine this with a high potency Microchannel Delivery Solution and post care Cellular Renewal Serum and Healing Accelerator specifically formulated to trigger the collagen-producing cells in your body to go into overdrive and create permanent new healthy skin! This dramatically improves the appearance of aging skin, increases the vitality of skin, and reduces the appearance of fine lines, wrinkles, uneven skin tone, acne and acne scarring. No Downtime – Put makeup on within an hour and a half! The typical recovery from this procedure involves just a day or so of mild redness and swelling, and any evidence that you've had something done can be covered with a quality mineral makeup. You'll experience an immediate improvement in skin tone, texture, laxity, fine lines and wrinkles. And you'll see long term improvement that really lasts when you complete a series of treatments as recommended by our skin care professionals. Contact us today to see if you're a good candidate for MicroChanneling. 21 year old man before, after 2 treatments, and after 4 treatments with ProCell Therapies micro-needling solution and home use of ProCell Therapies human growth factor serums.